Apparently Randy Moss knows how to wear out a welcome. The supremely talented but mercuial wide receiver was released by the Minnesota Vikings on November 1, just four games after rejoining the team where he started his NFL career, reports Sportsline. Vikings players confirmed that head coach Brad Childress informed them that Moss had been let go during a team meeting. "This decision was made based on what we thought was in the best interests of the Minnesota Vikings, both in the short and long term," Childress said via a statement released by the team. "We wish Randy the best as he moves forward in his career." 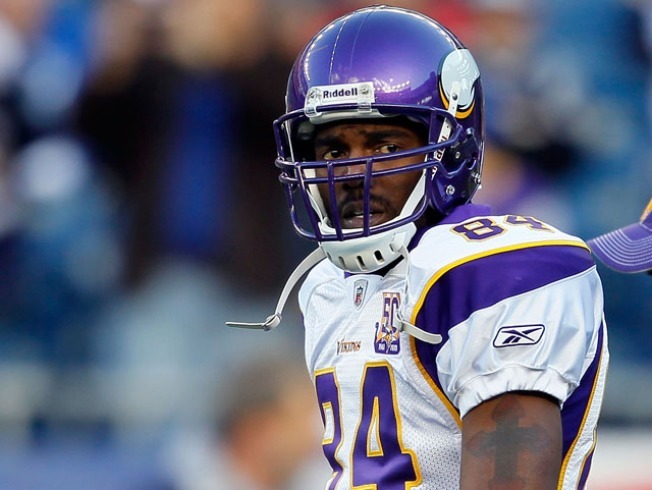 Moss was waived a day after he held a rambling, post-game press conference after the Vikings fell 28-18 to his old team, the New England Patriots. In his remarks, Moss first stated that he would not take any questions from the media and then he proceeded to heap praise on New England coach Bill Belichick and blast the Vikings for not using his advice about the inner workings of the Pats machine. "I'm definitely down that we lost this game. I didn't expect we'd lose this game," he said. "I don't know how many more times I'll be in New England again. But I leave coach Belichick and those guys with a salute: I love you guys. I miss you. I'm out." Moss had one catch for eight yards in his return to Foxboro Stadium. In his four-game stint with the Vikings, he snagged 13 catches for 174 yards and two touchdowns. Moss now heads to the waiver wire, where he can be claimed by another team. The NFL waiver wire is determined by win-loss records, meaning the 0-7 Buffalo Bills will get first crack if they wish to pick him up. The Carolina Panthers, Dallas Cowboys, Denver Broncos and San Francisco 49ers follow and the Patriots are currently last on the list. Should no team put in a claim, Moss becomes a restricted free agent and can sign anywhere. He's due to make a base salary of $6.5 million for this season, with the Vikings on the hook for $1.5 million. Whichever team picks up Moss will have to take on the rest of his contract.